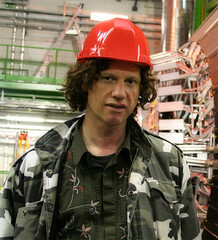 When I was at CERN in April, one other visitor with our entourage was Chris Morris. He’s practically unknown in the US — which is a crime, I assure you — but is very well-known in the UK for his incredibly funny, clever, and risque satricial comedy shows like "Brass Eye" and "The Day Today". He is also a science junkie, and while we were all at the Large Hadron Collider he chatted with Brian Cox about what the LHC will do. The CERN podcast of the interview is now online. Chris is a very intelligent and funny guy, and the interview may come as a bit of a shock to some fans of his since he really is earnest about the science. But lemme tell ya, Gia showed me some of the "Brass Eye" episodes, and I have to get a copy. Wow. Let me just say, it will never ever ever ever be broadcast in the US. But I laughed until I cried. YouTube has some samples… but most are very much NSFW. Check ’em out, and see how smart people can love science and be really funny, too.